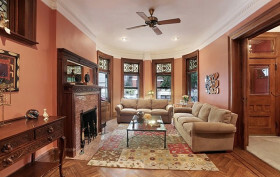 One of Park Slope’s most recognizable homes is available for $4.29 million. The 4,800-square-foot, semi-detached townhouse—which has been featured in numerous music videos, as well as in the movie Moonstruck—is one of a row of townhouses on 4th Street built by the Allan Brothers in 1892. 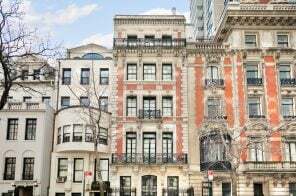 A five-bedroom triplex with a beautiful garden, this red brick and stone Romanesque Queen Anne townhouse features such romantic details as a turret bay façade, a castle-style balcony, transom stained glass, and a Spanish-tiled spire with an ornamental finial. The terracotta roof of this landmark dwelling also stands out with elaborate cornices. And we haven’t even stepped inside yet.